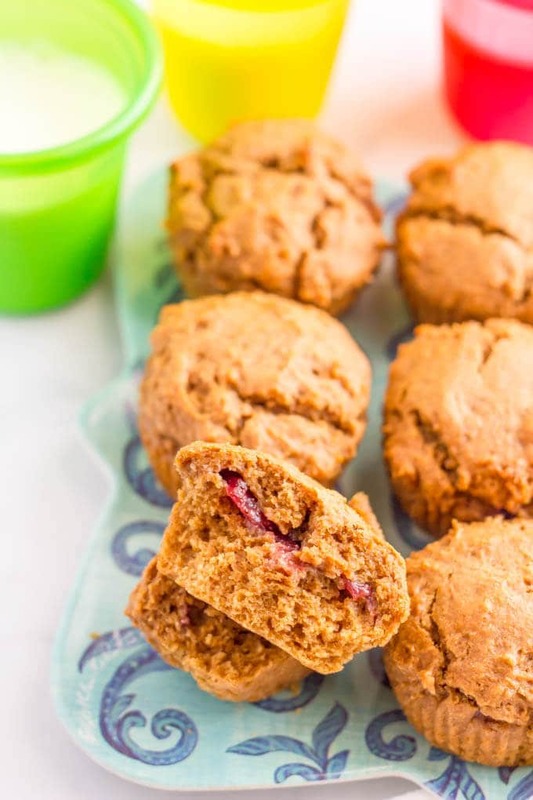 Healthy peanut butter and jelly muffins are whole wheat and naturally sweetened, with no butter or oil but plenty of peanut butter flavor and a fun jelly center! I think by now you guys know we are ALL about some muffins in this house. I probably bake at least 2 batches of muffins a week, more on weeks when we’ve run out and I’m replenishing our freezer stock. 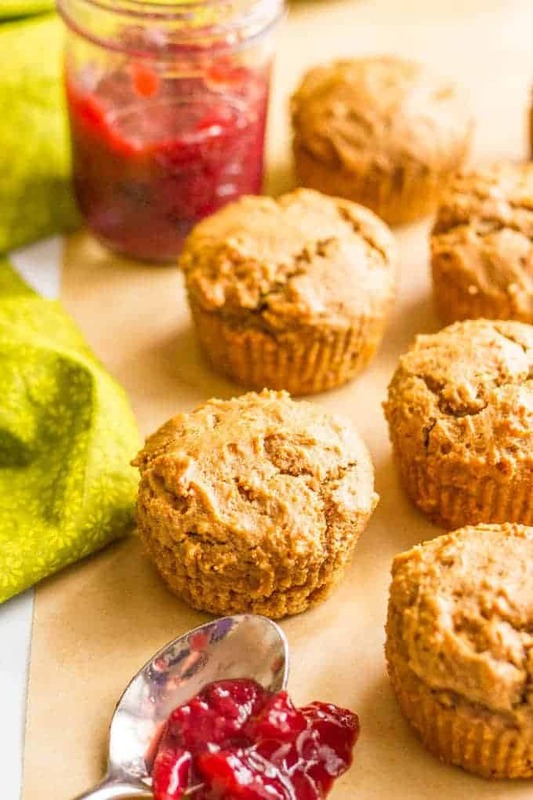 These healthy peanut butter and jelly muffins are our current obsession. 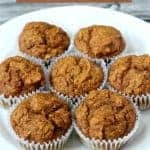 They are whole wheat and naturally sweetened (like many of my muffins – see my muffin category) and a great addition to school lunches. You can check out the video above 👆 to see how I make these and keep the jelly in the middle of the muffin. 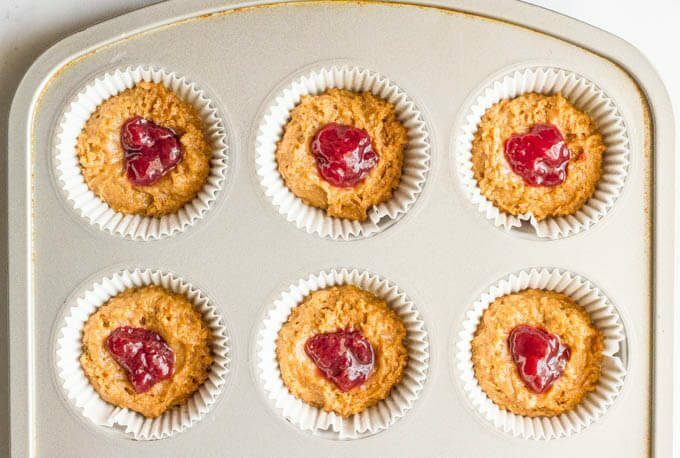 Basically you fill the muffin tins with a bottom layer of the peanut butter dough, then dollop a teaspoon of jelly in the middle of each cup and cover it up with another layer of peanut butter dough. This keeps the jelly in the center of each muffin. Wanna know what happens if you don’t do this carefully and cover up all the jelly? Nothing. Nothing happens. Some of the jelly leaks out the sides of the muffins and gets oozy everywhere. It actually looks pretty cool. It’s no longer a hidden gem in the middle of the muffin, but sometimes, you gotta glob it in there and go, no time to fuss with arranging dough and jelly. 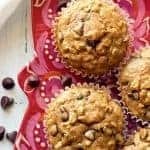 As I mentioned, you can substitute almond butter for these muffins if you have a child with a food allergy or you’re sending the muffins to a nut-free school. These are great for breakfast, for school lunches, for an afternoon snack or just for having on hand when you need an energy boost. These keep great! You can store them at room temperature for 2-3 days, in the refrigerator for up to 5 days or in the freezer for up to 5 months. We’ve always got some on hand. Also, I used my easy strawberry freezer jam cause I always have some in the fridge or freezer, but you can use a store-bought jelly and make these with any of your favorite flavors. Preheat oven to 350. Line a muffin tin with paper liners, then spray with cooking spray and set aside. In a large bowl, combine flour, baking soda, baking powder, cinnamon and salt. In a separate bowl, add eggs, peanut butter, honey, applesauce, milk and vanilla and stir until well combined. Add the wet mixture to the bowl with the dry ingredients and stir until just combined. The batter will be thick. 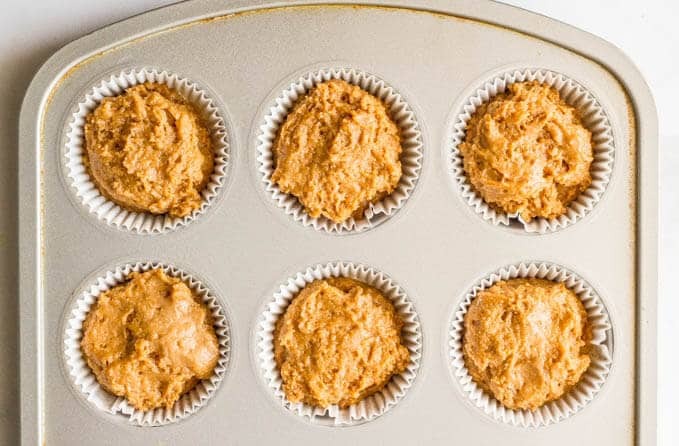 Fill each lined muffin cup about 1/3 full with the peanut butter dough. Wet your fingers and use them to press the mixture down and cover the bottom of each muffin tin. Spoon about 1 teaspoon of jam or jelly into the middle of each cup. Cover each cup with another dollop of peanut butter dough until all the dough is used. Use wet fingers to pat down the tops of the muffins and seal in the jelly filling. Bake at 350 for 16-18 minutes, until a toothpick inserted in the center comes out clean. 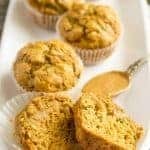 Cool the muffins on a wire rack then store at room temperature for 2-3 days, in the refrigerator for up to 5 days or in the freezer for up to 5 months. 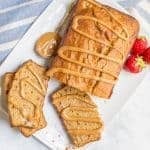 You can sub almond butter for the peanut butter to make these peanut-free. You can use 2% milk, skim milk, soy milk - whatever you have. I use my easy strawberry freezer jam, but you can use a store-bought jelly and make these with your favorite flavor. Well I need to come over to your house, because muffins all day, every day is my idea of a great time! 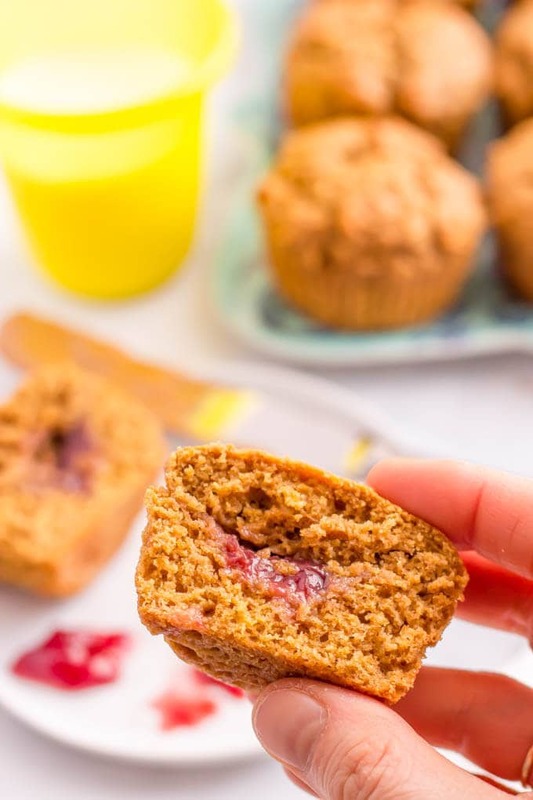 🙂 I am loving these PB & J muffins, girlfriend! That jelly center is so fun!!! Seriously, this is taking PB & J to a whole new, delicious level! 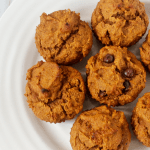 I could definitely eat these on repeat… which is totally acceptable since they are healthified! Yay! Pinned! Cheers chicka! Delicious looking muffins, I love the jam inside. I’ve never heard of a peanut-free school or kindergarten, it makes sense considering how dangerous peanuts can be for allergic people. I am happy that our kindergarten is sugar-free. Thanks Adina! A lot of schools here in the U.S. are peanut-free or have peanut-free classrooms to keep kids with allergies safe. But I love the idea of a sugar-free kindergarten! Okay, these look AMAZING. The jelly in the middle? Just plain heaven. What a great idea to put jam inside! These muffins look scrumptious! Will definitely try this recipe. Please tell me that you used natural peanut butter! I know that sometimes it is not recommended for baking because of texture but it’s the only PB we eat as there’s nothing added. I’d hate to have to buy the sugar laden one! Hi Claire! Yes, I use a natural peanut butter with no added sugar. Just peanuts and a pinch of salt. I hope that helps and I hope you enjoy these muffins! What a fun make ahead breakfast! 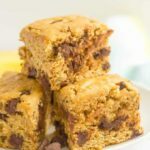 These are perfect for a quick morning breakfast! They are so fun! We love them for breakfast, lunch and snacking too! A great on-the-go muffin!